The Progressive Railroading site reports that Milwaukee Mayor Tom Barrett released a new plan for the planned streetcar system. The new plan calls for adding a line along the Lake Michigan lakefront to benefit from recent real estate developments in the area and to help spur further development. Funding would come from federal funds previously committed plus tax increment financing generated by development along the line. Approval will be required by the Milwaukee Common Council to draw on the $54.9 million in federal money and $59 million from tax increment funds. The mayor cited $2.6 billion in downtown development completed over the decade of 2005 to 2014, another $980 million currently under construction, and almost $1.3 billion proposed development as an indication that the city needs the streetcar system. The project has been held up by a State requirement that the city pay for relocation of private utilities. The city is appealing the requirement but the mayor's plan includes a provision for the city to pay the relocation costs if the decision is upheld. 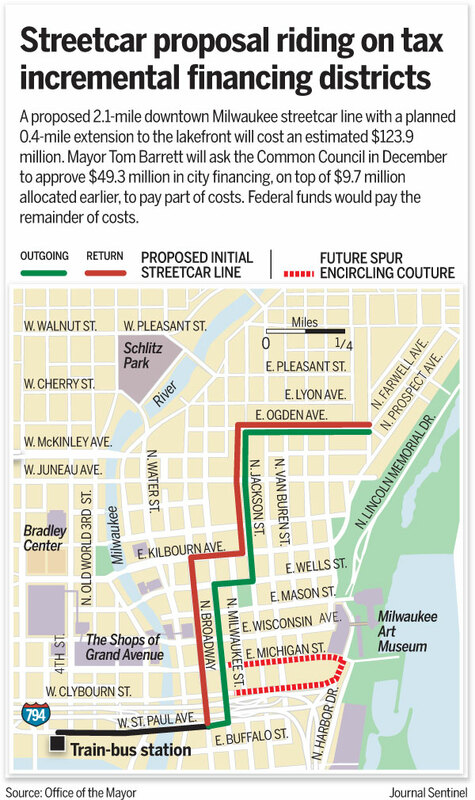 The Journal Sentinel reported more about the Mayor's plans. Barrett's plan aims to move the streetcar project forward, with construction beginning in late 2015 for an opening in 2018. Project cost in total owuld be $123.9 million. Barrett claims the project will connect new business development, tie together amenities and allow people to move seamlessly downtown. He said the streetcar is part of a "comprehensive, 21st century transportation policy," that includes cars, parking, buses and bicycles. He pointed out that younger, better educated adults prefer living in cities. A study showed that in the Milwaukee-Waukesha-West Allis census area, 12,614 college-educated, 25- to 34-year-olds lived in close-in neighborhoods in the city, up from 9,557 in 2000. Other cities are seeing the same pattern and Barrett cited successful cities having rail transit sysems to support this movement.